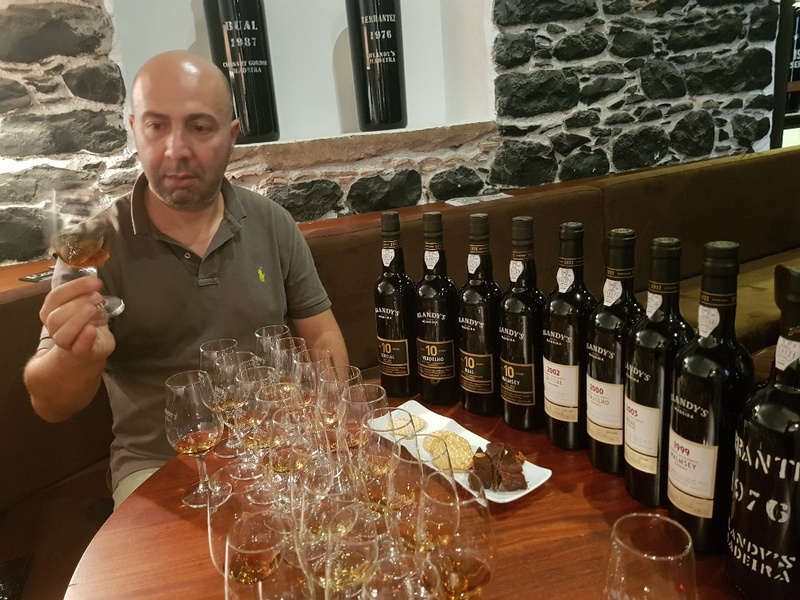 To go tasting Madeira wine, you stop in downtown Funchal, capital of this magical volcanic island in the Atlantic and closer to Africa than it is to Portugal. Jacaranda trees are in full mauve bloom, and grassy public spaces show bright with red and yellow and pink flowers which add to the realisation that Madeira is a garden island where nature, soil, sea and growth are vital, and the earth is looked on by the inhabitants with pride. 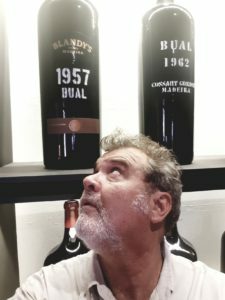 In these surrounds, Blandy’s Madeira Wine Lodge commands an unassuming presence on a narrow road, the entrance deceptively modest and non-descript, for beyond the doors lie some of the greatest wines in the world. I can’t exactly remember when this fascination with Madeira wine began, except that my introduction to its oxidised richness happened when I was far too young and dumb to appreciate it. Hazy recollection sees a teenager in a Lisbon hotel bar drinking Madeira and helping the barmen disassemble a revolver he had just inherited from an uncle. Vines on the island of Madeira. The wine was sweet, warm and nice although the gun metal was cold and smelt of oil. Then, some fifteen years ago, South African wine legend Dave Hughes heard me enquiring as to where one could find Madeira wine in Cape Town. I was preparing for a wine club gathering and wanted something different. Next day, Dave walks into my office hauling six bottles of wine, a whole range of Madeira he had procured on his global tasting circuit. The wine never reached the wine club, but I got to taste a whole lot of Madeira. Dry, semi-sweet and decadent syrup-like elixirs they were, drawing me in because I had never experienced something quite like this. There was a character, a mysterious agedness about the wines, something exotic, yet something very leathery and classic, harnessed in tradition. 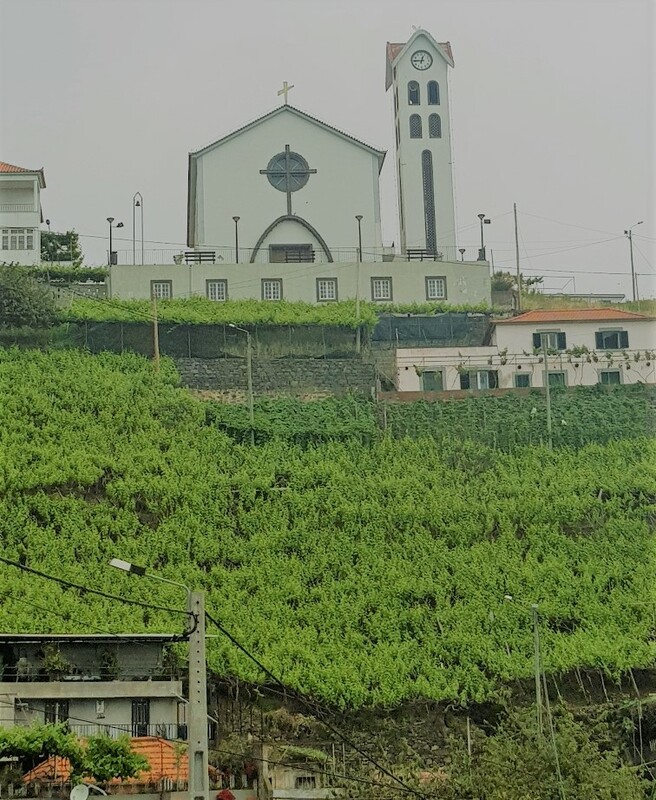 I was hooked, and since that first discovery determined to make the pilgrimage to the island of Madeira, to grab the wines in the land where they are from. So we stand at the entrance to Blandy’s, a Madeira wine business founded in 1811 by an entrepreneurial Englishman who had come to the island for health reasons and is still run by the family. Guiding me is Joaquim Sá from Amorim Cork, suppliers to Blandy’s and various other Madeira wineries. He is just the kind of wing-man you need when searching for a suitable sentence in Portuguese or the way to the nearest seafood restaurant. And like me, he gets the look of a lost waif from the other side of the island when tasting a fine Madeira. Joaquim Sá working his way through the Blandy’s line-up. 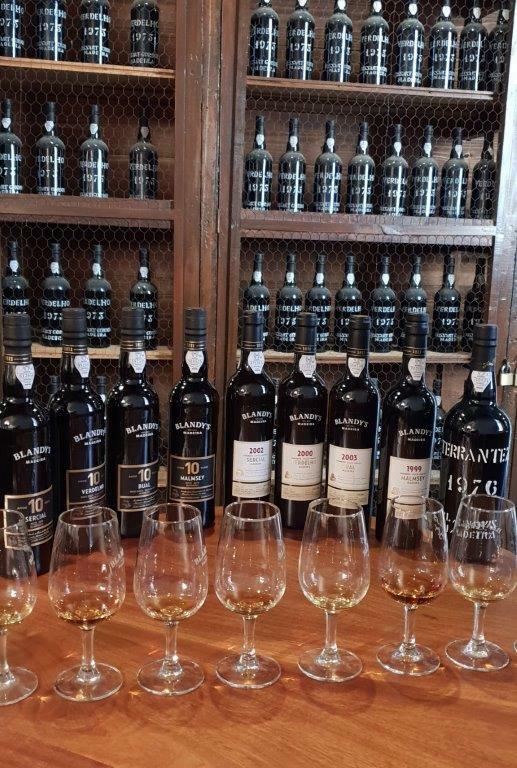 The tour through Blandy’s is informative, taking in the island’s unique semi-tropical terroir and volcanic soils that provide an un-matched environment for growing the grapes needed to make the wines worthy of the name Madeira. A run-down of fermentation and fortification is given, and in the vaults filled with large old barrels the roles of wood and maturation is accentuated. 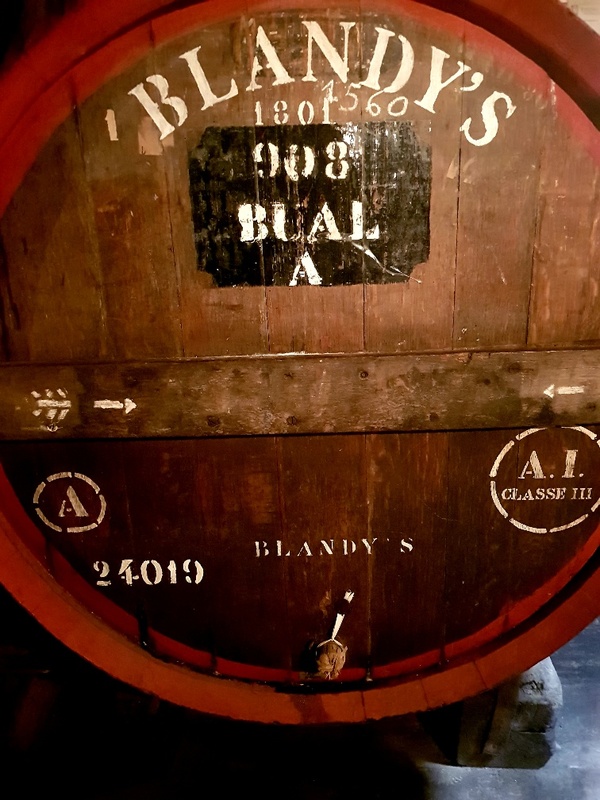 Because it is in these barrels – Blandy’s likes porous American oak – where the contents undergo the magical process that transforms them from terroir-specific wines to those brilliant liquids layered in unrivalled complexity and with irresistible allurement. 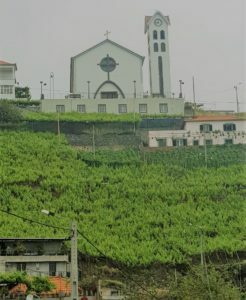 It is not only the process of oxidation, but the exposure to heat that makes Madeira what it is, and in these rooms the temperatures are allowed to reach the high 30s (degrees celsius) so as to jig the chemistry of the wine, giving it longevity as well as the flavours of ocean, nuts, flowers and split wood so distinctive of its body. The barrel cellar is atmospheric, dark and evokes an almost spiritual mood as one looks at the casks wherein the wines made from the grapes Sercial, Bual, Verdelho and Malvasia are elevated into a status of hallowedness. An array of clubby-like areas invite one to taste the Blandy’s, and we were ushered into a space behind a cordoned-off area. The walls are lined with ancient bottles of wine, dusty and protected by wire barrier from prying hands and illicit thoughts. 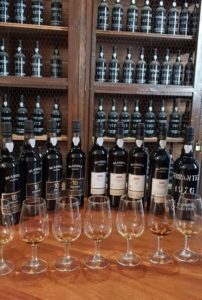 The experience was of the four primary Madeira wines: Sercial, Verdelho, Bual and Malvasia, or Malmsey as it is oft referred to today. These were all 10 year old Blandy’s, but alongside we were offered the same varieties, but from older vintages. I looked at the line-up before me, the bottles and the hues of the liquid lying in the glass. I pulled the aroma of aged grapes and crafted wines through my nose, and said a silent prayer and thought of a few sins I needed pardoning. The Blandy’s style is pure, expressive and on the rich side. The wines have sturdy textures that express themselves luxuriously on the palate, coating parts of the mouth oral surgeons still have to discover and which island-loving maidens must still kiss. 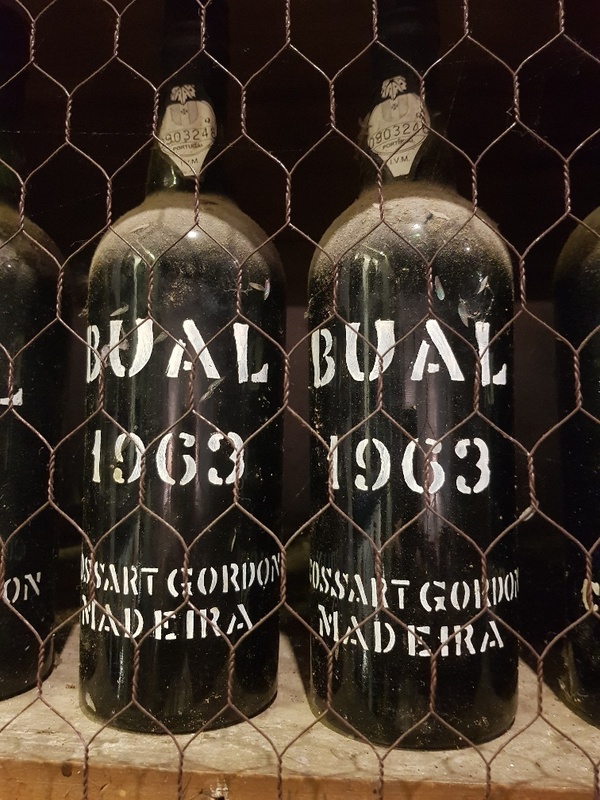 Sercial is arguably the most riveting of the Madeiras, made from a grape that has enough acidity to wipe the smile from Julie Andrews’ face during her second outburst in The Sound of Music. So much so that as a young wine, Sercial is referred to by locals as “the dog that bites”. Fortified and warmly aged in oak, however, the wine is eased into a state of life-affirming, hip-swinging brightness. The Blandy’s 2002 is not as dry as a fino sherry, for example, showing notes of tar, dried figs and Havana smoke in abundance, but elevated with a freshness and verve that is fascinating. Verdelho starts to display fruit: quince, custard apple and rum-flamed banana coming to the fore. But once again, the incredible vital acidity kicks with the grace of a Ronaldo half-volley, awakening the senses you never knew you had, plus a few others. 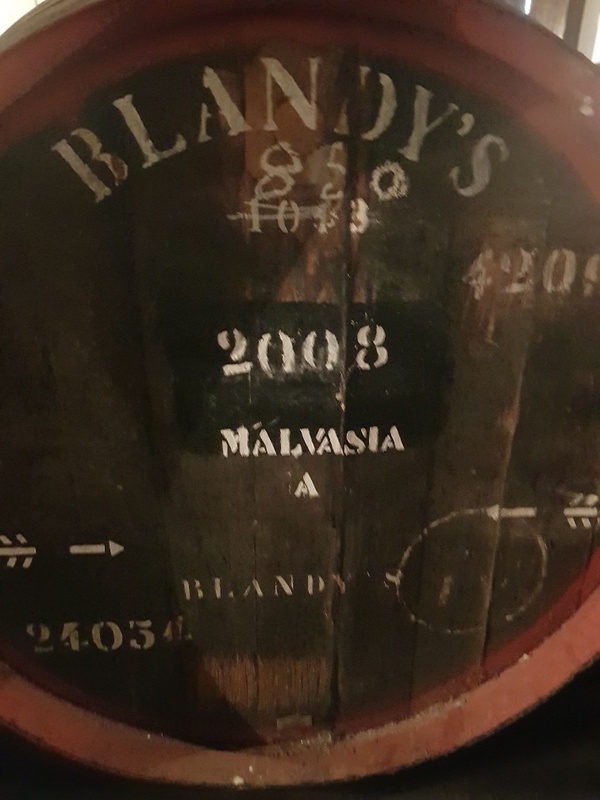 Here the standard Blandy’s 10 Year Old Madeira Verdelho was an example of island craft at its best, and I somehow will never forget that after-taste of smoked almonds and crushed peach kernels. Getting onto the sweeter side of things, and Bual from Blandy’s has the same level of sugar one will find in many Malmsey’s. But as the Grateful Dead sang, acid is life here. 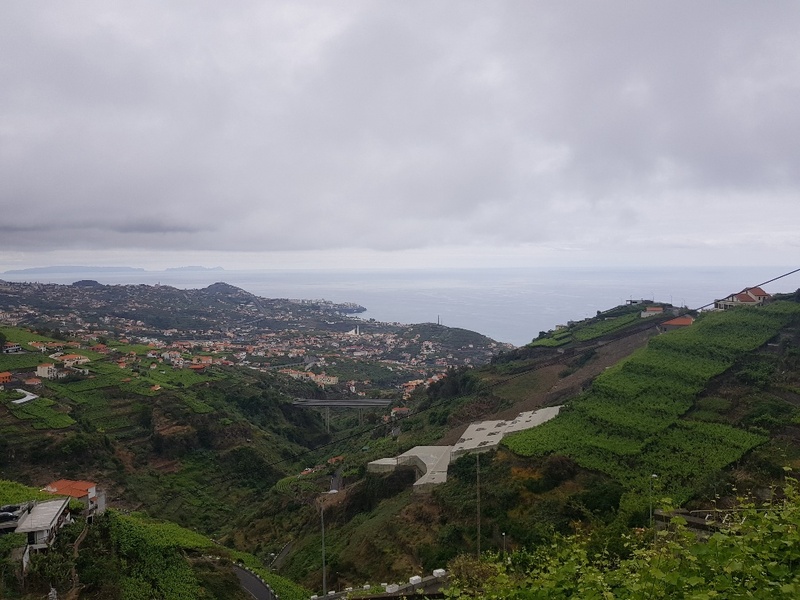 Those potassium rich volcanic soils mainline serious acidity into the vines, the result being one of the major factors for Madeira being able to age so beautifully. 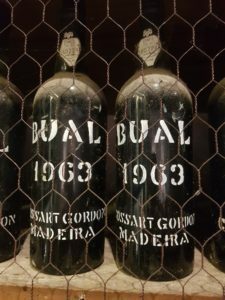 We had the Bual 2003, and I had to stand up to allow my head to clear so as to find out if there was not a dream or unsuspected narcotic invasion going on. Treacle sponge meets pickled Moroccan lemon, with roasted coffee beans, molasses and black raisins coming to the fore. The mid-palate is surreal, and the finish is sweet and memorable, tender as a nun’s polite smile at the end of an ill-mannered joke. I will always have a soft spot for Malmsey, as this was the first Madeira I experienced. Made from the floral Malvasia grape, it is rich and sweet, and sumptuous as the Blandy’s style calls for. The 1999 lay in the glass like the syrup from a soaked fruit cake, and the aroma was surely the perfume that must have attracted Adam to the apple. I am thinking just-cut Bolivar torpedo cigar, prunes stewed in the black honey of Algerian bees fed on cannabis pollen. There is pecan-nut tart, burnt crust of a crème caramel and smouldering sun-dried hay. A hit of tamarind wakes the senses from their confected slumber, and once again an attention-seeking thrust of acidity ensures the wine is living, loving and loving to live. 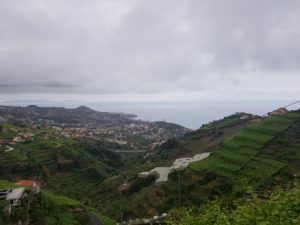 So here you are, experiencing Madeira at its source, where wine always tastes better. In another world, and wondering if you can actually go home again? The flowers looked even prettier, still, as we left. Gosh.. I got back from a week in Funchal last night. I was at Blandys on Tuesday 19 and Friday 22.